Struma ovarii is a rare ovarian tumor, representing 0.5-1% of all ovarian tumors and 2–5% of ovarian teratomas. It is defined as an ovarian teratoma composed mostly of thyroid tissue. The symptoms are nonspecific, and the imaging studies can help in characterize the mass; however, the definitive diagnosis is usually given by the Pathologist. Classically, the treatment is the surgical resection of the ovarian mass, however there is no consensus regarding the follow-up. 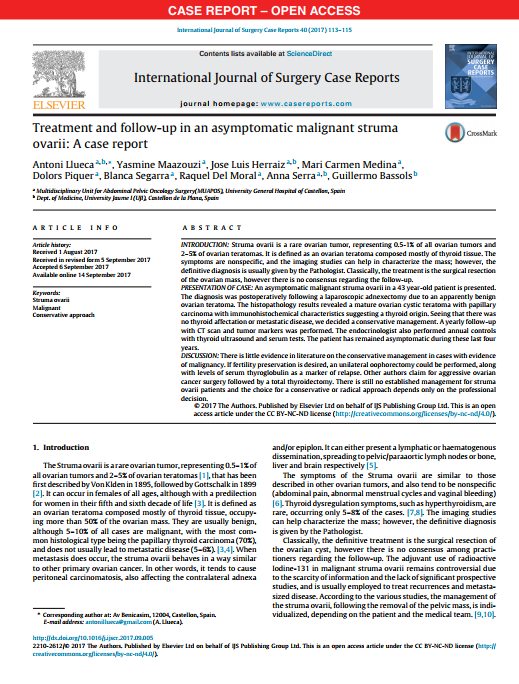 An asymptomatic malignant struma ovarii in a 43 year-old patient is presented. The diagnosis was postoperatively following a laparoscopic adnexectomy due to an apparently benign ovarian teratoma. The histopathology results revealed a mature ovarian cystic teratoma with papillary carcinoma with immunohistochemical characteristics suggesting a thyroid origin. Seeing that there was no thyroid affectation or metastatic disease, we decided a conservative management. A yearly follow-up with CT scan and tumor markers was performed. The endocrinologist also performed annual controls with thyroid ultrasound and serum tests. The patient has remained asymptomatic during these last four years.